So, you’re thinking about installing a fireplace in your home? That’s great! Now you just have to decide what kind of fireplace is right for you. There are a wide variety of fireplace types to choose from, and finding the one that is right for you can be difficult. Today, we wanted to help you make that decision, so we put together this short list of pros and cons for the two most common fireplace types: wood and gas. Clean Burning – Both natural gas and propane are relatively clean burning fuels. That means gas fireplaces are better for the environment than wood-burning alternatives. No Chimney Needed – Because gas fireplaces burn cleanly, there is no need to have a chimney. Instead, you can simply vent the exhaust to an external wall or roof vent. Simple On/Off Operation – Last, but certainly not least, is ease of use. With the flip of a switch or the push of a button, you can have wonderfully comforting heat emanating from your fireplace. But make sure that you purchase a model that has a pilot light or allows manual lighting in the event of a power outage! Lack of Ambiance – For many people, heat is only one part of owning a fireplace. There are some amazingly designed gas fireplace logs, but the ambiance is quite the same as a wood fire. Before choosing gas, make sure you won’t miss the crackling logs, the slight scent of burning wood, and the opportunity to watch a fire burn down to embers. 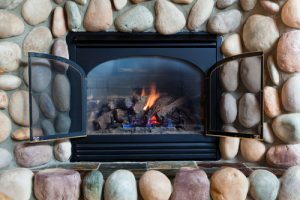 Gas Line Installation – While you don’t need a chimney, Gas Fireplace Installation will require running a gas line to the new fireplace location. If your home has not been set up for gas before, this can require additional time and money to set up. Faulty Gas Line Hazards – A faulty gas line connection or a gas leak can put your family in danger very quickly. Professional installation is recommended to minimize this possibility. Works Anytime – When you have a wood burning fireplace, you never have to worry about power outages, pilot lights, or fuel levels. As long as you have wood, kindling, and a lighter or match, you’re good to go. Cheap Fuel Source – This one might be less applicable if you live in the city, but for most people wood can be purchased quite inexpensively or even be found for free. Always make sure that you have enough wood on hand for your fire needs. Full Experience (Ambiance Galore!) – If you choose a wood burning fireplace, you get the full experience of having a fire. 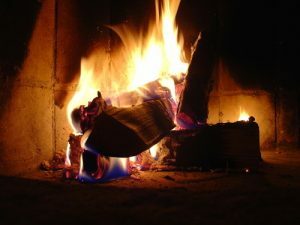 You can enjoy the light scents that come from a wood fire and even burn different woods that have a particular scent like apple wood or mesquite. You also get the ambient sound of a crackling fire and the primal satisfaction that comes from watching a fire consume wood and burn down to glowing embers. Must Have a Chimney – If your home doesn’t have a chimney, they can be troublesome and expensive to have put in. For many people, however, it’s well worth any hassle in order to have a wood fireplace installed. Smoke, Ash, and Wood Storage – These can be the biggest down sides to wood burning fireplaces. Cleaning ash from the fireplace regularly and storing and hauling wood are both time consuming and hard work. Smoke, if it is not properly drawing up the chimney, can be hazardous to breath. Requires Regular Sweeping and Inspections – To keep your family safe and happy, you need to have regular Fireplace and Chimney Inspections. If you’re in the Dallas, Fort Worth or Austin area and choose to go with a wood fireplace, our CSIA certified chimney sweeps will be happy to help you out! Well, there you have it. Hopefully, this post will help you make an informed decision between wood and gas fireplaces. If you still have questions, Contact First Choice Chimney Today!